Reading and tanning - the best kind of multi-tasking. Order up some small plates and call it dinner. The massive fitness center is well equipped, no matter what your routine entails. Pretend you're no good, then go for the win. Plan a few dinners in, keeping it simple (in true vacation spirit). The resort is a 5 minute walk to all the fun and excitement on the Strip. Relax with a delicious beverage and enjoy the view of the city at SkyBar 38. The Bellagio Fountain show is well worth the 11 minute walk. Enjoy the view of the city from the High Roller ferris wheel, only a 6 minute drive from the resort. Planet Hollywood & Casino is an 8 minute walk from the resort—test your luck. Play a hand of poker at Wynn Las Vegas Casino, a 12 minute drive from the resort. Situated a convenient half-block off the world famous Strip, the Marriott's Grand Chateau is themed, like most everything in Vegas. As heavily hinted by the name, this resort channels France – the sunny south to be exact – and pulls it off with panache. Get your workout in early at the (surprisingly un-French) massive fitness center before parking yourself in a lounger around the cabana-lined rooftop pool, sipping the occasional cocktail from the SkyBar 38. Or if it’s getting close to lunchtime and you’re looking for eats, sample the signature classic burger or grilled chicken tacos from the Level 5 Pool Bar and Grill (thumbs up, right?). Later on in the day, map out your casino-filled evening plan over tapas and (yet more) cocktails in the Lobby Bar, then head out for a night on the town. Or save that plan for another night, and gather your crew in the hot tub instead. Comfortable one- and two-bedroom villas are both available in larger footprints perfect for groups that plan to spend more time inside their residence, and smaller footprints for those thinking they’ll be mostly out exploring. There’s even a three-bedroom option, perfect if you’ve got a good-sized crew. 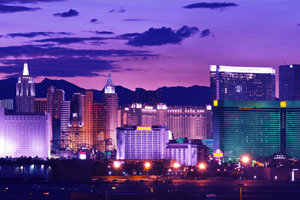 Each residence has a glitzy view of the Strip, which gets even glitzier at night when the neon’s at full-strength. Well appointed kitchens are equipped with cookware and appliances, including coffee makers for DIY baristas. Or you can run down to The Marketplace and grab a Starbucks and breakfast to go. The in-suite washer/dryer means you can pack light. And you’ll appreciate the extra space in your bags once you get a dose of the impressive shopping scene. When you’re ready to call it a night (even if it’s technically already morning), head for the master suite for a soak in the oversized tub before collapsing in the king bed and drifting off to dreamland. During renovations, every effort will be made to minimize noise and disturbance.